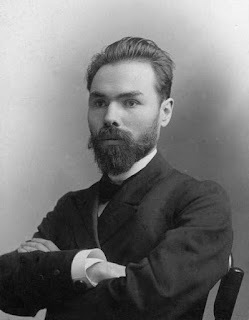 Valery Bryusov was one of the leading names of Russian poetry at the beginning of the twentieth century, and he would become especially involved with Armenia and the Armenians in the 1910s. The future poet was born on December 13, 1873, into a merchant’s family in Moscow. His parents had little to do with his upbringing, and Bryusov was largely left to himself as a child. He was a voracious reader of everything that fell into his hands, including the works of Charles Darwin and Jules Verne, as well as various materialistic and scientific essays. He received excellent education and studied in two Moscow gymnasia from 1885-1893. Then he went to Moscow State University from 1893-1899. Bryusov was still a university student when he started his literary career in the early 1890s. He translated poetry by the French Symbolists (Paul Verlaine, Maurice Maeterlinck, and Stéphane Mallarmé) and Edgar Allan Poe. He also began publishing his own poems, which were influenced by the literary movements then in fashion in Europe, Decadentism and Symbolism. In order to give Russian Symbolism a dimension that it still did not have, Bryusov made recourse to a mystification. Thus, he published three volumes of his own poetry, entitled Russian Symbolists: An Anthology (1894-1895), with different pen names. The trick proved successful and attracted several young poets to the ranks of Symbolism. Bryusov became an authority after the appearance of his fourth collection of poetry (1900). The celebration of sensual pleasures and the mastery of a wide range of poetic forms characterized his poetry, which he published in several more collections until 1921. His editorship of Vesy (The Balance), an influential literary magazine, from 1904-1908 consolidated his position in the Russian literary world. Among his eighty books, he also had historical novels, short stories, plays, essays, and translations. As a translator, Bryusov was the first to render the works of Belgian poet Emile Verhaeren into Russian. He also translated works by Victor Hugo, Jean Racine, Lord Byron, Oscar Wilde, Johann Goethe, Virgil, and others. On this basis, in June 1915 the Armenian Committee of Moscow approached him with a proposal to work on an anthology of Armenian poetry. Bryusov researched all bibliography available in several European languages, and fell enamored of Armenian literature. In his superb introduction to Armenian poetry from the Earliest Times until Our Days , published in 1916, he wrote: “While studying Armenia, I found an inexhaustible source of spiritual and sublime pleasures… As a historian, as a man of science, I saw in the history of Armenia a whole original world, whose thousands of interesting, complex questions raised scholarly interest, and as a poet, as an artist, I saw a similarly original world in Armenian poetry, a new and yet undiscovered universe, where high-valued productions of true literary creation glittered and shone.” He also studied the Armenian language for several months and wrote a monograph, The Annals of the Historical Fate of the Armenian People. In January 1916, once the preparations for the anthology were basically finished, Bryusov departed to the Southern Caucasus to get acquainted with Armenian reality and introduce his work to the public. He sojourned in Baku, Tiflis, Yerevan, and Etchmiadzin, where he gave very successful lectures about Armenian history and poetry, and read from among his more than 170 translations from more than 40 Armenian poets. Bryusov would become the first author to introduce Armenian poetry in such a comprehensive way to the Russian audience. Most of his translations still keep their freshness a century later. He also wrote a series of poems dedicated to Armenia, and even planned to prepare an anthology of Armenian prose from the fifth to the twentieth century. In 1923 he was named popular artist of Soviet Armenia for his work on the anthology. In the 1910s, Bryusov’s reputation gradually declined, as his poetry began to seem cold and strained to many of his contemporaries. Unlike many fellow Symbolists, he remained in Russia after the revolution of 1917. He supported the Soviet government and earned a position in the cultural ministry of the Soviet Union. He helped draw up the proposal for the Great Soviet Encyclopedia. He became the head of the Chamber Book of Moscow, and later of the scientific libraries and the literary section of the Commissariat (ministry) of Education of Soviet Russia. In 1921 he founded the Higher Institute of Literature and Art, which was named after him in 1923, and was its rector. There, he also taught various subjects: history of Russian and ancient literatures, metrics, comparative grammar of Indo-European language, and even history of mathematics. His collections of poetry published after the Soviet revolution marked him as one of the founders of Soviet literature. Bryusov passed away on October 9, 1924, in Moscow. The Yerevan State Pedagogical Institute of Russian and Foreign Languages (now Linguistic University), founded in 1935, was named after him in 1962.